Global warming. Renewable energy. Hazardous waste. Air Pollution. These and other environmental topics are being discussed and debated more vigorously than ever. 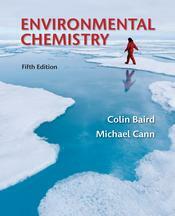 Colin Baird and Michael Cann's Environmental Chemistry is the only textbook that explores the chemical processes and properties underlying these crucial issues at an accessible, introductory level. With authoritative coverage that balances soil, water, and air chemistry, the new edition again focuses on the environmental impacts of chemical production and experimentation, offering additional "green chemistry" sections and new case studies, plus updated coverage of energy production (especially biofuels), the generation and disposal of CO2, and innovative ways to combat climate change.